A good strategy call from the team to bring Nico in under the safety car on the first lap to switch to the harder prime tyres put him in a great position on track and an assured drive from there allowed Nico to make up six places on his starting position. Mercedes GP Petronas finished the 2010 season in fourth place in the Constructors' Championship with 214 points with Nico finishing seventh place in the Drivers' Championship with 142 points and Michael finishing ninth place with 72 points. 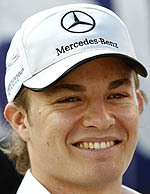 Nico Rosberg: "I'm very pleased with fourth place and it's the best that we could have hoped for from my grid position. Special thanks to Ross and James Vowles for a great strategy today. We had a good pace on the hard tyres, just like in qualifying, and I was able to make the most of that performance when it mattered. Thanks to everyone here at the track and back at the factory for all of their hard work this year. Although we didn't get the results that we wanted on track, I am sure that we will improve massively for next year and have more fun then. Congratulations to Sebastian today and he deserved the title. Next up, we have the test later this week which will be very important to get a headstart on adapting to the new tyres." Michael Schumacher: "First of all, big congratulations to Sebastian for his great victory and taking the title today. That was extremely well done after his season was so mixed but he was able to come back strongly in the last few races. As for me, I am totally fine and was not hit by anything in the incident. I had to go to the Medical Centre just for a precautionary check. I went off the line, spun and because of the dirt there, the back of the car just came around. It's a shame obviously as I would have liked to finish the season with a more positive ending but I am already looking forward to fighting again next year. I would like to say thank you to everybody in our team for all of their hard work." Ross Brawn: "That was a fantastic performance from Nico today and a perfect way to finish the season for us. As a team, we achieved the absolute maximum with the car that we have with a great call on strategy from the guys on the pit wall and a well-executed pit stop. Then it was an excellent and controlled drive from Nico who found the pace exactly when he needed it. Michael unfortunately made a mistake on the first lap and got caught out which is a shame. I'm very excited about next year with the team and drivers that we have and we will have a lot more fun competing where we want to be. Congratulations to Sebastian on his first Drivers' title today, to the Red Bull team for a great job and to Dieter Mateschitz for the vision and commitment that he has shown over the last five years." Norbert Haug: "Our sincere congratulations to the new World Champion Sebastian Vettel and to Red Bull Racing for a well-deserved victory in both Championships this season. From our race today, the good news is that Michael was not hurt after his spin and Tonio was also ok after crashing into him, which was not Tonio's fault. The resultant safety car and our very smart strategy to bring Nico in for the prime tyres was crucial for the race and for Nico's well-deserved fourth place which came after a brilliant drive during which he posted the third fastest lap of the race. We have finished this long season with a good result with Nico beating two of the World Championship contenders. Thank you to everybody at Mercedes GP Petronas for the relentless work in 2010 when we achieved the best possible results with our technical package in the last third of the season. We are looking forward to the new season and our plan is to improve our new car in order to compete with the top three teams after having finished in fourth place this year."